« Social Graphs Are Everywhere… We just weren’t paying attention. 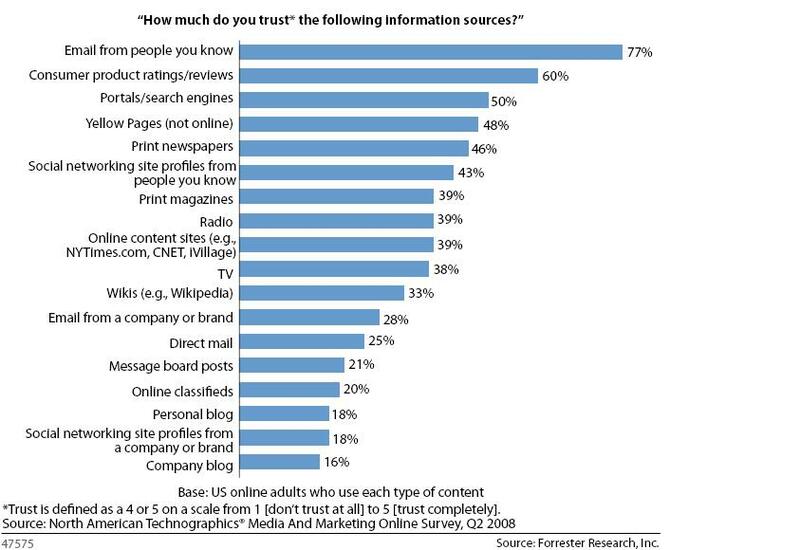 Just a quick rundown based on a great article by Josh Bernoff about the mistrust of the corporate blog. I’ve recently discussed how portable social graphs are slighly shifting attention towards email and the address book and how powerful the concept could be. Beyond corporate blog mistrust, this article delivers a powerful second message loud and clear: email is the most trusted conversational medium. Not a coincidence that it’s also the oldest, most reliable and most flexible. From people you know: Email beats social networks 77% to 43%. This just can’t be neglected! People trust consumer product ratings / reviews (60%). The Amazon story... Making the recommendation model social while leveraging Email as a Social Graph and communication medium can lead to some pretty powerful models for the Amazon marketing bottom line. You might soon see “This is Johnny. I just rated the iPhone 8GB 5+ stars. Read what I had to say.” in your in-box. Email / Mail campaigns could potentially go from 26% to 68% in consumer trust. Take the current 25-28% in trust for direct mail or email from a company and look at the 60-77% ratings for reviews and email from people you know. This is the groundbreaking basis for a new age of digital marketing. Here again, the thought of social graph enabled and meaningful marketing interactions (reviews, recommendations, private sales, “hand me over” coupons, the list is long…) is exhilarating to say the least. People now, also trust whatever comes up as trends in search.twitter.com .. isn’t it?